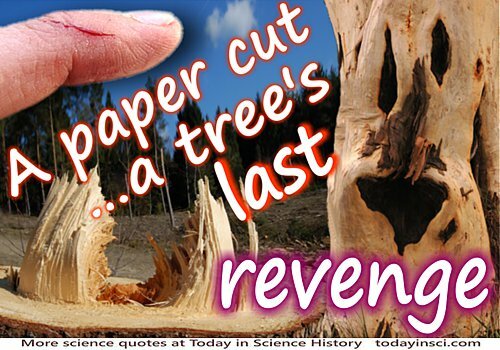 A paper cut — A tree's last revenge! Title of a web page. Deformed persons commonly take revenge on nature. The Advancement of Learning, Bk VI, Ch. 3. In 'Of Death', Essays (1625, 1883), 10. Science and technology revolutionize our lives, but memory, tradition and myth frame our response. Expelled from individual consciousness by the rush of change, history finds its revenge by stamping the collective unconsciousness with habits, values, expectations, dreams. The dialectic between past and future will continue to form our lives.